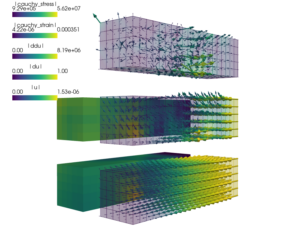 The linear elastodynamics solution of an iron plate impact problem. The used elastodynamics solvers expect that the total vector of DOFs contains three blocks in this order: the displacements, the velocities, and the accelerations. This is achieved by defining three unknown variables 'u', 'du', 'ddu' and the corresponding test variables, see the variables definition. Then the solver can automatically extract the mass, damping (zero here), and stiffness matrices as diagonal blocks of the global matrix. Note also the use of the 'dw_zero' (do-nothing) term that prevents the velocity-related variables to be removed from the equations in the absence of a damping term. python simple.py examples/linear_elasticity/elastodynamic.py -O "ts='tsb'"
# Longitudinal and shear wave propagation speeds. # Mesh dimensions and discretization.